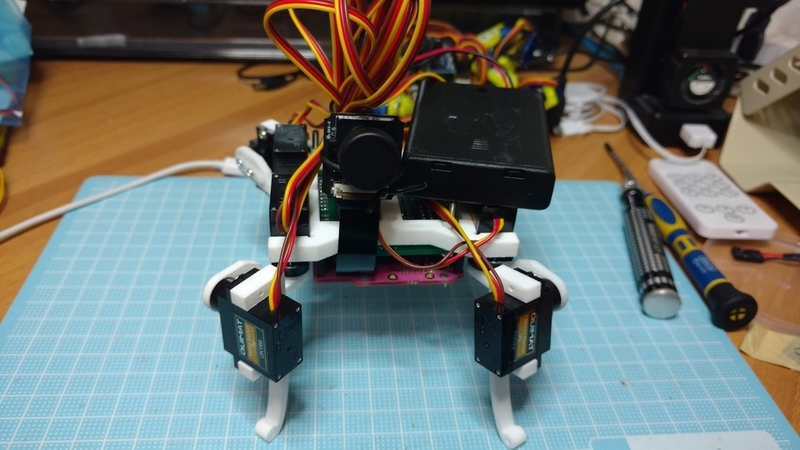 [youtuasi] is a Desktop Quadruped Robot. 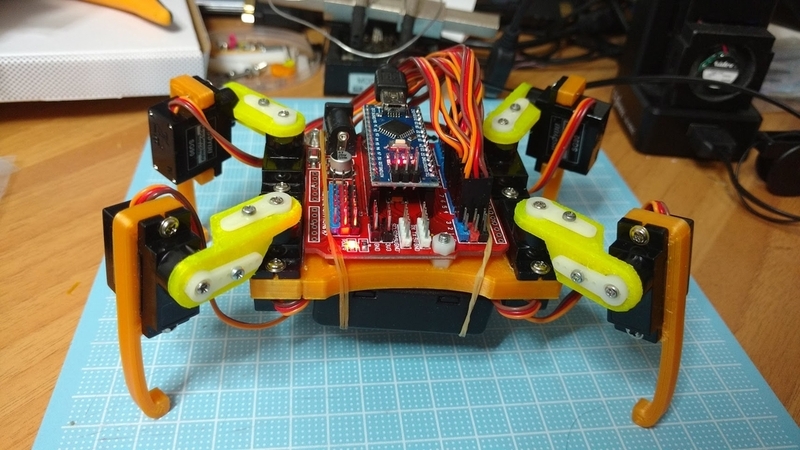 This is desktop Quadruped Robot call to youtuashi(yo.tu.a.si). Use Arduino Nano and SG90 or Clone Servo Motor x8. Only 9 Print Parts 8 DOF smaller 4 legs robot. Easy make and Easy play about 3Days. Day1: Buy the parts from Amazon or other store. Day3: Compile and Run for Arduino IDE. Basic Model (Arduino Nano) front view like a crab. GR-LYCHEE Model for AI and Image processing test bed front view like an octopus. rotation model side view. like a piglet. Use PLA or PETG filament. I recommended PETG one. Printed 9 parts for your own 3D printer. Arduino fixed M3x15mm plastic bolt and nut with spacer . SG90 Servo motor fixed body and legs with M2x10mm screw..
Download and write sketch and set the basic position. Download and Open for Arduino IDE 1.8.5. or later. And Write for Arduino Nano. 1. Sketch is mePed_nakarobo_COM.ino . This sketch is based on The mePed. This program is based on code written by Alexey Butov (www.alexeybutov.wix.com/roboset) "
Open serial monitor 9600bps and Input numeric. youtuasiTest.zip is 「youtuasi」motion test sketch. youtuasiTest.ino is robot controler for Arduino IDE serial console. [ youtuasi] is basic position. If no match youtuasiTest.jpg and your robot legs,you gona check servo motor hone angle. The motion check are ended, you will write into the sketch, "case" between "break". youtuasiPorkTest.zip is 「youtuasi」like a piglet motion test sketch. youtuasiPorkTest.ino is baseed on youtuasiTest.ino. ・Software Compatible for many Quadraped Robot pionears in Arduino comunity. Top cover or under cover are made yourself for 3D printer. Claw or Hoof are made yourself, and atach to legs use M2 bolt and nut. Arduino Nano A0 to A7 are open for set the own sensors. Arduino Nano D10-D13 are open for exstra servo motors. 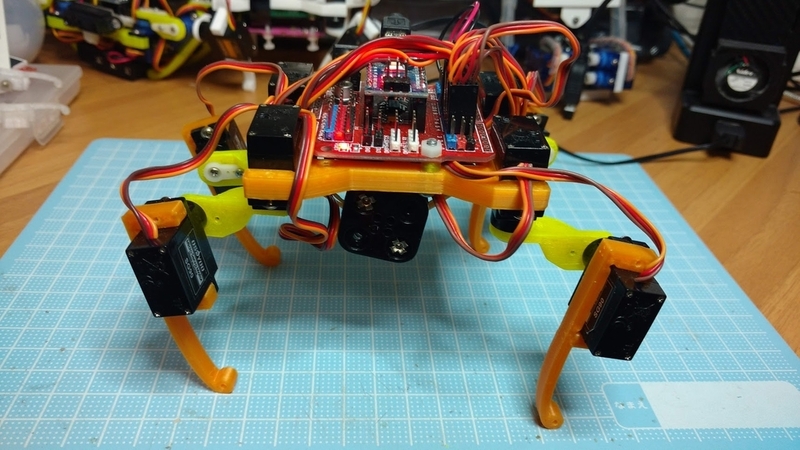 In Japan Quadruped Robot are not major. Robots image in Japan is wheel or two legs. but two legs robots are so difficult to make and expensive. then I modeling Quadruped Robot between two.